This historical novel is drawn from domestic and community life of Sakina evolving around two objects of women’s art. Both are of considerable social and artistic values among two culturally unalike people living side by side as separate yet in some ways inter-reliant societies on the savannah. One art object is the bandhani shawl of the Khoja Ismailis, a trading settler Asian African community adhering austerely to a distinct faith tradition rooted in Sufism and Vedic beliefs that absorbs Sakina’s spiritual life. The other is the emankeeki, a beaded neck to chest ornament of the Maasai, a pastoralist African people to whom the savannah is the ancestral home and source of their art, spirituality and well-being that Sakina yearns for during moments of torments in her life. photo courtesy Ameer Bhai Janmohamed. Sparkle of 31 bandhanis. 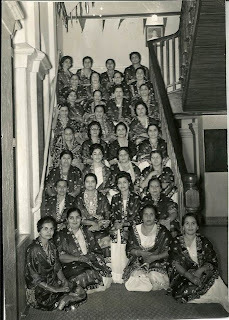 This picture was one among several, a collection composed by Ameer Bhai Janmohamed in memoriam of beloved Malek Chachi (Malek Bai Somji) sitting in the front row, first from the left. 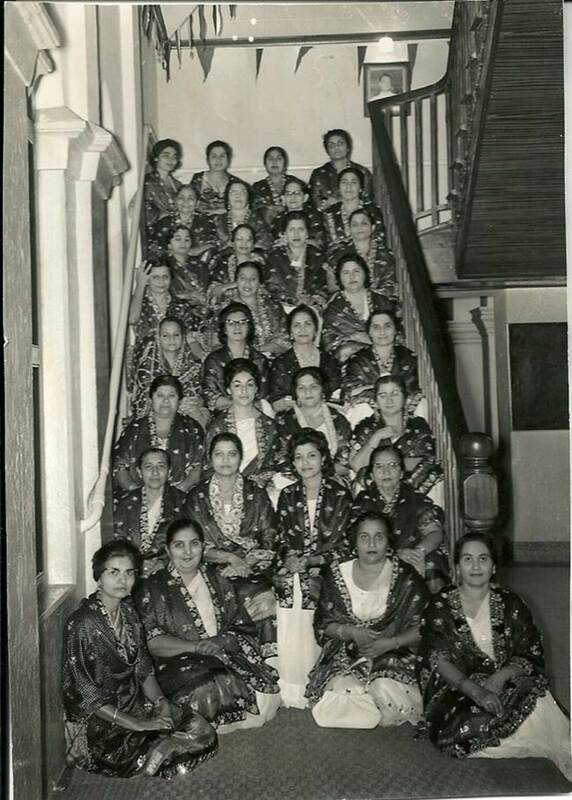 6th row Mrs Hami, Gulzar Bai Mansur Satchu, Nabat Bai Lalani, Nurbanu Bai Satchu. Front Row Malek Bai Umedali Somji (Malek Chachi), Mrs Jamal Habib Kara, Dolutkhanu Bai Ebrahim Tarmohamed, Nurbanu Bai Sultan Fazal Bhanji. (Looking for first names of those marked in blue. If you can recognize the ladies, please let me know. Also if anyone is misidentified or her name spelt incorrectly please notify me at fssomjee@gmail.com This list of names is created with the assistance of Ameer Bhai Janmohamed and Shariffa Khesavjee and continues to be updated with your help. Thank you all for your participation, ss). Satpanth Khoja marriage. Shirin Bai Gwadery, Nairobi late 1930s. Rehema Bai Ramji wearing her wedding bandhani. Dar-es-salaam 1930s. 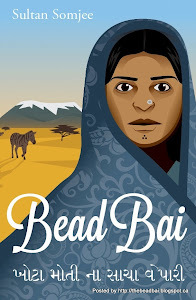 "In this account of Bead Bai, several aspects of cultural commonality are also portrayed that continued to be practiced for long by the Ismalili, Sunni and Ithna-Asheri Khoja. In fact some of the practices are common to all Cutchi and Gujarati communities, Hindu and Muslim alike. One such example illustrated is the use of ‘Bandhani’ a richly embroidered silk shawl that provides for as head covering for the bride and retained as a family treasure to be eventually draped on the coffin of the lady. This has been common practice among both Khoja Ismaili and Ithna-Asheri for long.The Ithna-Asheri Khoja went a step further as they adorned the Alam (banner) of Hazart Abbas during the months of Muharram with a Bandhani. It was in such high esteem that the Bandhani was held in Khoja culture. This custom continued until 1974 when the Ithna-Asheri community in Mombasa convened an open forum to review rites, rituals and traditions in vogue. Among the changes brought about as a result, the use of Bandhani for the Alam and draping over the coffin were then discontinued. Such Open Forums had no less hilarious moments as the hard-core traditionalists, especially among the ladies, found it sacrilegious to let go of the long practiced traditions." Extract from the review of Bead Bai by historian Hassan A. M. Jaffer. Haasan A.M. Jaffer is the renowned author of The Endangered Species (2013), a book about how the Khoja Ithna Asheri jamat started to separate from the Khoja Ismaili Satpanth jamat from late 19th century onwards.